Comments made by former CIA Director John Brennan in an interview with MSNBC’s Rachel Maddow suggest that the CIA may have used a tactic known as “reverse targeting” to collect data on members of the Trump campaign. In the Aug. 17 interview, Brennan discussed concerns about Russian contacts with U.S. citizens during the 2016 presidential election. “I was very concerned and aware that the Russians were trying to leverage U.S. citizens in order to achieve their objectives in the presidential election,” Brennan said. Despite Brennan’s apparent concerns, he admitted that these contacts may have been completely innocent—there was no proof that these same U.S. citizens had been successfully leveraged by Russian efforts. But that surveillance moved forward anyway, and may have occurred before and after the election. BRENNAN: When I left office on January 20th of 2017, I had unresolved questions in my mind about whether or not any of those U.S. persons were working in support of the Russian efforts. MADDOW: And those were referred—those concerns about specific U.S. persons—to the FBI. BRENNAN: We call it incidental collection in terms of CIA’s foreign intelligence collection authorities. Any time we would incidentally collect information on a U.S. person, we would hand that over to the FBI because they have the legal authority to do it. We would not pursue that type of investigative, you know, sort of leads. We would give it to the FBI. So, we were picking things up that was of great relevance to the FBI, and we wanted to make sure that they were there—so they could piece it together with whatever they were collecting domestically here. That’s not how incidental collection is supposed to work. More importantly, the collection described by Brennan doesn’t sound incidental. The surveillance sounds targeted. Unlike the surveillance of Trump foreign policy adviser Carter Page, which used a traditional FISA warrant granted by the Foreign Intelligence Surveillance Court, the surveillance being described by Brennan occurred under Section 702 of the Foreign Intelligence Surveillance Act (FISA). Traditional FISA surveillance relates to electronic surveillance and physical searches of non-U.S. persons, facilities, or property inside the United States, while Section 702 surveillance allows for targeted surveillance of foreign individuals located outside the United States for the purpose of acquiring foreign intelligence information. A “significant” purpose of the surveillance must be to obtain “foreign intelligence information” and U.S. citizens can’t be intentionally targeted. Provisions known as minimization procedures are intended to protect information “incidentally collected” on U.S. citizens in the course of foreign surveillance. “From what I know right now, it looks like incidental collection. We don’t know exactly how that was picked up but we’re trying to get to the bottom of it. It sounds like the legal envelope was being pushed in regard to the CIA’s domestic involvement and investigative pursuit. It also sounds like a coordinated effort to process and share the collected information that Brennan referred to during his interview. More importantly, it sounds like the CIA may have used targeted collection of Section 702 data, skipped the minimization requirements, and fed the raw surveillance data directly to the FBI. It would be helpful if the former CIA director would provide some clarification of his remarks. What exactly, did he mean by, “Any time we would incidentally collect information on a U.S. person, we would hand that over to the FBI because they have the legal authority to do it”? Was this targeted Section 702 surveillance using reverse-targeting techniques? Was this being done on all U.S. persons, or did this particular description apply only to specific individuals? Were standard minimization procedures correctly followed by the FBI and CIA? Incidental collection happens all the time. U.S. citizens are inadvertently caught in foreign surveillance. But Brennan’s comments sounded specific to certain U.S. citizens. Brennan’s comments sounded like a description of the activities that Nunes uncovered in March 2017. A closer examination is needed. Perhaps we’ll get one from the Department of Justice inspector general’s pending report on FISA abuses. 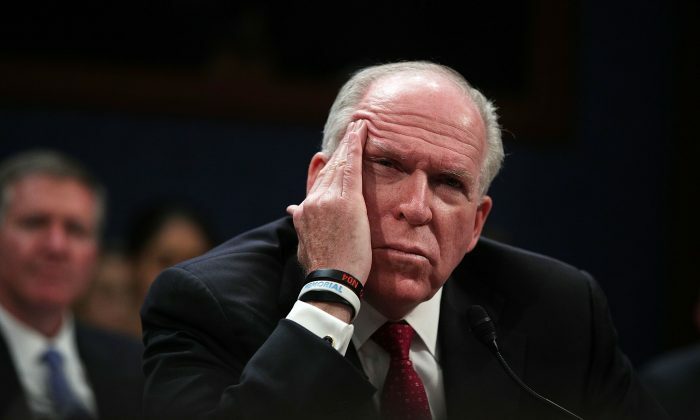 Because it sounded like Brennan may have admitted to something close to the illegal targeted surveillance of U.S. citizens.